New Shoes, originally uploaded by indiaeden. 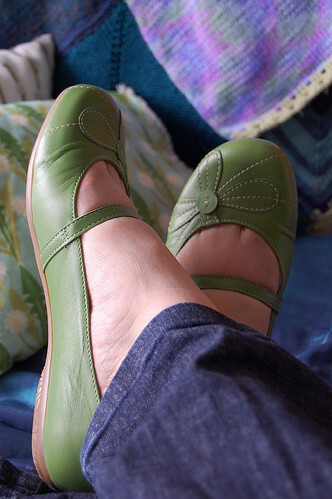 Shoes, nice green shoes. I wasn't going to buy these, but egged on by Eden, they just slipped into my basket while I was ordering India a new raincoat. It did occur to me that they would match very nicely the pram I have been looking at. Thanks to Rachel, I've now found the pram even cheaper, locally, but I wont be buying yet. Woody and I are just not sure we can cope having it in the house, so not yet. Life around here is pretty dull right now. I'm basically just waiting, watching the clock tick by, the days roll by, glad when it's bed time and another day has gone, not so glad when I open my eyes and I have another day to get through. I hate living like this, in limbo, waiting for this baby, and at the same time longing for Florence. I don't want it to be a full year since she left us, and at the same time I want the next three months over with so I can hold baby boy here in my arms. This is coping though. My house is pretty clean, the laundry is done, the children are fed each day, and of course loved. I'm clean, make up done, hair blow dried...this is coping, and pretty much anything more is too exhausting to consider. ooh those are lovely - I need details! OH these are gorgeous. Just my taste. Are the Campers? And I know the feeling of waiting for a baby and longing for another. Not an easy place to be in, that's for sure. Shoes are sole reviver from boring old Next. Sounds to me like you are doing much more than just coping. Glad you decided to treat yourself such a happy Spring colour! Thinking of you lots and saying those prayers. Scrummy shoes ... and it sounds to me as if you are doing so well ... what is this make-up of which you speak!? Such pretty shoes! I always think of you with great shoes, even though I've never met you or seen your feet for real. You'll look fantastic pushing your pram, staring at your well-dressed, sweet baby this summer. Good for you coping so well. I'm sure some days fall apart, some are good. That's okay. make up and blow dry, clean house and laundry done is more than coping, Jeanette! I often don't manage those things. Love the shoes. I was tempted by them on the Next website but have a Schuh discount voucher to use so will shoe shop there soon. Fancy a cuppa one day soonish?